Offering you a complete choice of products which include jar stretch blow moulding machine 8 lt to 20 ltr, pet blow moulding machine, automatic pet blow molding machine, 20 ltrs jar semi automatic pet blow molding machine, pre heating pet blow moulding machine and moulding machines. We are offering Jar Stretch Blow Moulding Machine to our clients. We are a manufacturer of Pet Blow Moulding Machine for mineral water bottles and cold drinks bottles with good experience and technology. Manual feeding of two performs into the Infrared Conveyor device for heating. Use of the best spares from renowned manufacturers like Mercury, Ultra etc., ensures best product quality. Easy change of the mold. Programmable process control by PLC. Above all, our fast and efficient after sales service gives us the cutting edge over competitors. 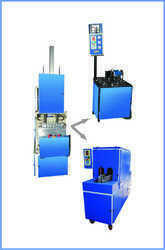 We are a trustyworthy organization offering a wide a gamut of Automatic PET Blow Molding Machine. We are renowned manufacturers of a range of 5 ltrs. to 20 liters Jar Semi Automatic Pet Blow Molding Machine, which is recognized for features such as, durability, sturdy construction, and enhanced functionality. Our machines are known for the easy operability and requirement of minimal maintenance. The machines require minimal power and are extremely safe to use. Manual feeding of two pre-forms into the infrared conveyor heating. Use of the best spare parts procured from renowned manufacturers like Mercury and Ultra. 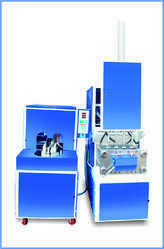 Our organization offers a wide variety of 1 Litre Machine with Pre Heating Pet Blow Moulding Machine – Ikon Series. These machines are fitted with the manual feeding of two pre-forms into the infrared conveyor heating. 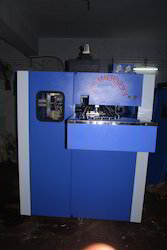 Any and all spares utilized in the machines are procured from reputed manufacturers, such as Mercury and Ultra. 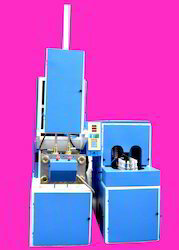 We are foremost manufacturer and exporter of premium quality Moulding Machines. Extensively used for blow molding process of bottles, their leading edge yet simplified technology are widely appreciated among our clients. Our team with technical excellence in this field designs these machines in various configurations while considering precise demands of our esteemed clients. 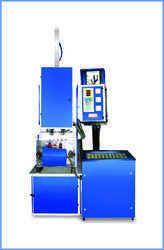 Apart from this, we provide these machines at equitable price tags for our vast clientele base. Ours is one of the leading manufacturing units, involved in the fabrication of Pet Automatic Stretch Blow Moulding Machines. These are recognized globally for features, such as durable construction, efficiency, and industry leading rates. The machines have a simple design, yet offer the highest levels of functionality. Our range of machines uses a combination of pneumatic and hydraulic versions for a better quality output. Features: Mechanical and electrical safety systems ensure robustness and long lasting service of the components The main function of start-up operations are combined on the machine integrated LCD control panel Easy and safe operation Low power consumption Programmable process control by PLC. Production Capacity: 200 ml to 5 ltr. 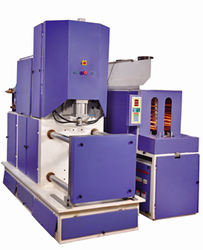 We are a trustyworthy organization offering a wide a gamut of Stretch PET Blow Molding Machine. 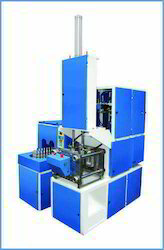 Looking for “Blow Moulding Machines”?